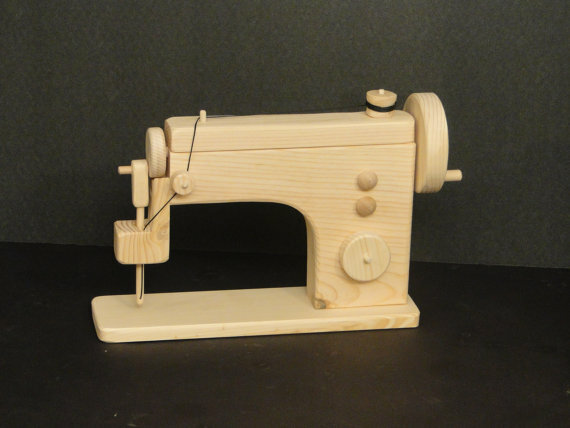 I wasn't planning on posting today, but I came across the most darling toy sewing machines from Toys By John on Etsy. How perfect for Create With Kids Month! The craftsmanship on these just took my breath way! The machine can actually be threaded, and when you turn the knob the needle moves up and down. And I love that they look more like a modern sewing machine than the 'vintage' Singers.What child of a sewist wouldn't love one! Even with shipping, the price is unbelievable. HERE is a direct link to the listing. Disclamer-- I haven't received anything for this post at all. I just thought this was too neat not to share with ya'll!